A curriculum evaluation gap was addressed by exploring the final year of the Oregon Consortium of Nursing Education (OCNE) curriculum through student perception of competency and benchmark proficiency. Researchers used a mixed-methods design to explore RN to baccalaureate (RNBS) student self-assessment data on perceived benchmark proficiency. Students' written statements were coded into four attainment categories, ranging from not attained to strong. Researchers categorized strong attainment in the competencies of intentional learning, relationship-centered care, and clinical judgment, with moderate attainment in ethics, communication, health care team collaboration, and reflection on self-care. Competencies related to leadership, practicing within a broader health care system, and application of evidence in practice had limited attainment. The foundation for all nursing professionals is their prelicensure educational program. The quality of the curriculum affects the employer–employee relationship and client care, with broader effects on the larger nursing profession and health care systems. The Oregon Consortium for Nursing Education (OCNE) curriculum, featuring a guiding set of competencies and benchmarks, was first formed more than 10 years ago to meet the developmental needs of nursing students and the health care needs of Oregonians (Gaines & Spencer, 2013; Gubrud et al., 2003; Tanner & Herinckx, 2012). Assessment of student experiences in year 1 of the curriculum was completed from 2006 through 2010 (Ostrogorsky & Raber, 2014). This study represents the first standardized assessment of core competency attainment in the final year of the curriculum. The data obtained from this mixed-methods study are derived from student perceptions of competency benchmark proficiency. OCNE is a statewide coalition of associate degree (AD) nursing programs partnering with the baccalaureate program of Oregon Health & Sciences University (OHSU) School of Nursing. The Consortium provides a seamless system for RNs to complete their baccalaureate degree after graduation from one of 10 AD community college nursing programs throughout the state. After obtaining RN licensure, they may transition into OHSU School of Nursing's RN to Baccalaureate (RNBS) Completion Program, completing the Baccalaureate of Science (BS) with a major in nursing through online coursework. Students matriculate into the university RNBS program with varied backgrounds and nursing experiences, many directly upon graduation from AD programs. Coursework within the first community college years of the OCNE curriculum supports concepts of relationship-centered care, clinical judgment, collaboration and teamwork, self-reflection, intentional learning, ethical practice and care, and communication within acute care nursing roles. In the final year of study, students receive education in community/population health, leadership, and evidence-based practice. Some of these topics may also have been addressed in their AD programs or through work experiences. The American Nurses Association (2014) defined competency as an expected level of performance that integrates knowledge, skills, and behaviors. Competence implies a performance aspect of a job or position, whereas competency implies a nontask-oriented behavior supporting this performance (Cowan, Norman, & Coopamah, 2005). A benchmark includes one or more defined objectives to achieve a competency (OCNE, 2015). More than one benchmark is used to define a competency. They support a student-centered approach to learning, serving as prerequisites for life-long learning (Boahin & Hofman, 2014; Levett-Jones, Gersbach, Arthur, & Roche, 2011; Takase & Teraoka, 2011). Self-assessment of competency or benchmark attainment is a component of professional development that includes assessment and feedback from faculty and clinical preceptors (Adair, Hughes, Davis, & Wolcott-Breci, 2014; Boahin & Hofman, 2014). Competency-based curricula focus on training and student attainment of competencies specific to performance as new graduates (Boahin & Hofman, 2014; Conner & Theilmann, 2013; Fan, Wang, Chao, Jane, & Hsu, 2015; Llasus, Angosta, & Clark, 2014). Higher levels of self-assessed competency correspond with factors such as prior work in other health care roles and length and quality of clinical rotations (Baker & Durham, 2013; Gallagher, Smith & Ousey, 2012; Hengstberger-Sims et al., 2008; Knight, 2011). Self-assessment error related to over- or underevaluating competence, as compared with objective assessment, is a potential limitation to a self-reflective assignment (Adair et al., 2014; Brinkman, Tichelaar, van Agtmael, de Vries, & Richir, 2015; Iacobucci, Daly, Lindell, & Griffin, 2013). Student motivation to address proficiency gaps is crucial (Boyer, Tardif, & Lefebvre, 2015). Thus, self-report should not be used alone in evaluating competence, as students may have difficulty accurately assessing their own proficiency. However, consideration of the students' assessment of self-confidence in benchmark and competence attainment is critical, along with objective assessment to support this attainment. Faculty and preceptor assistance to identify student experiences as they relate to benchmarks may shift student self-perception of proficiency and raise confidence. Associate degree curricula emphasize competencies focused on direct bedside nursing, care coordination, and management (Kumm et al., 2014). The OCNE consortium AD schools add concepts of health promotion and chronic and acute care. Initially, students do not gain experience in community settings, nor have they looked broadly at the nursing role beyond acute or long-term care settings. Students build competence in community-based clinical sites during the final year of the OCNE curriculum. By the completion of this final year, students expand their conception of nursing practice from direct patient care to nursing within a system of care, from a bedside nurse to a leader within interprofessional teams, and as a participant in quality improvement activities implementing and evaluating evidence in their nursing practice. Students in the OCNE programs complete a common curriculum developed in the early 2000s, implemented in 2006 (Gaines & Spence, 2013; Tanner, Gubrud-Howe, & Shores, 2008), and updated twice in the past decade. OCNE competencies reflect essential nursing professional criteria drawn from and supported by national guidelines foundational to curriculum design (American Association of Colleges of Nursing, 2008; American Nursing Association, 2014; Brady, 2011; Quality and Safety Education for Nurses, 2014; Sherwood & Zomorodi, 2014). The OCNE curriculum focuses on the development of these 10 competencies as a “centerpiece of the education reform plan” (Gubrud et al., 2003, p. 165). Specific to the RNBS curriculum are 87 Level 3 (L3) benchmarks (OCNE, 2015), including three associated Level 2 (L2) benchmarks (Figure). These benchmarks are built on the national recommendations of RNBS programs to include leadership and management, community/public health, research, population health promotion, legal/ethical aspects of nursing, communication and information technology, interprofessional team collaboration, ethical problem solving, and advocacy (Conner & Theilemann, 2013; De-Brew & Lutz, 2010; Fetter, 2009; McEwen, White, Pullis, & Krawtz, 2014; Poulton & McCammon, 2007; Utley-Smith, 2004). The OCNE competencies and each level of benchmarks provide direction and outcomes for courses in the curriculum. The final L3 benchmarks under each competency are spiraled from the AD program L1 and L2 benchmarks. 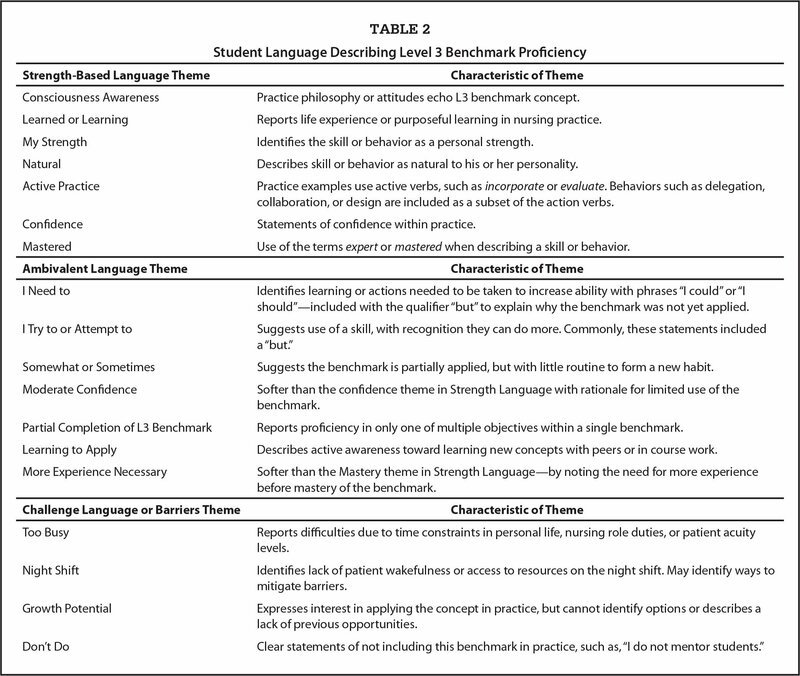 Over the 3 years from the AD nursing program through the baccalaureate, expectations related to student behavior and performance are formally or informally assessed six times using the L1, L2, and L3 benchmark levels (Figure). 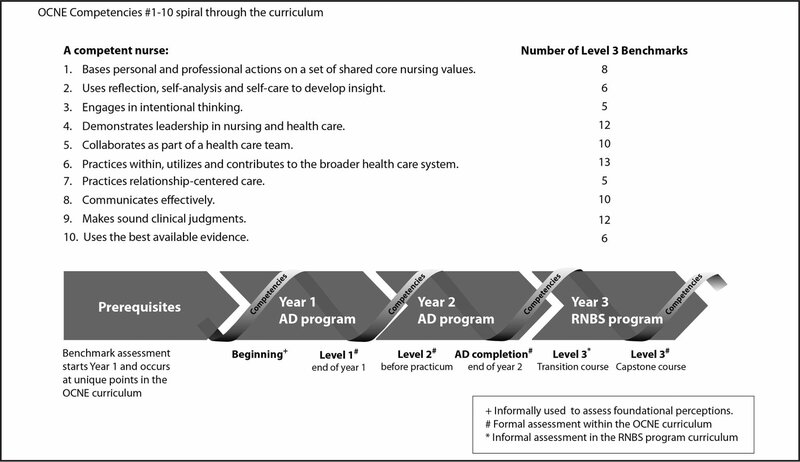 A description of the progression of students from the associate degree (AD) through the RN to Baccalaureate (RNBS) Completion Program, using the Oregon Consortium for Nursing Education (OCNE) framework of competencies and benchmarks, focusing specifically on Level 3. The timing for each formal or informal assessment of benchmark level is indicated. OCNE curriculum (2015) overview is retrieved from http://ocne.org/students/Curriculum.html. Adapted with permission from the Oregon Consortium for Nursing Education Competency Rubrics and Benchmarks. Copyright Northrup-Snyder, K., Menkens, R.M., & Forney, K. (2016). As students begin the RNBS program, the focus in this final year is on the L3 benchmarks. Students take a transition course at the beginning of the RNBS program that provides content supporting student transition from their AD program to the final year in the university baccalaureate nursing program. Students complete their nursing requirements with a capstone clinical course. To determine student experience with OCNE competencies, faculty developed a benchmark self-assessment learning activity used first within the transition course, and again during the capstone course. This benchmark self-assessment provides students with an opportunity to engage in critical reflection regarding their perceived proficiency at the L3 benchmarks. In addition, it provides faculty with a means of evaluating student progress toward program goals. Students, even those with experience as nurses, will not see themselves as competent in all L3 benchmarks in the transition course. However, by collecting student self-perceptions of these benchmarks at the first and last courses, it is possible to identify emerging themes of students' perception of proficiency or performance as they move forward to complete their baccalaureate degree. With the development of the OCNE competencies and benchmarks, questions were raised about the ability of the new graduate to attain L3 benchmarks at completion of the BS degree or if this would take 2 to 3 years of nursing practice (R.M. Menkins, OCNE Curriculum Work Group, personal communication, May 1, 2004). RNBS students may not perceive proficiency in all benchmarks by the end of the program; however, changes in student understanding of how to integrate these benchmarks into their nursing practice may be evident. Because competencies and associated benchmarks are developed to support curricular design to achieve the highest levels of professionalism, awareness of student perceptions of proficiency is important to determine individual confidence in these practice standards. Researchers captured data from a single time point of student OCNE Competency and Benchmark Self-Assessment in one transition and one capstone course within the RNBS Completion Program. 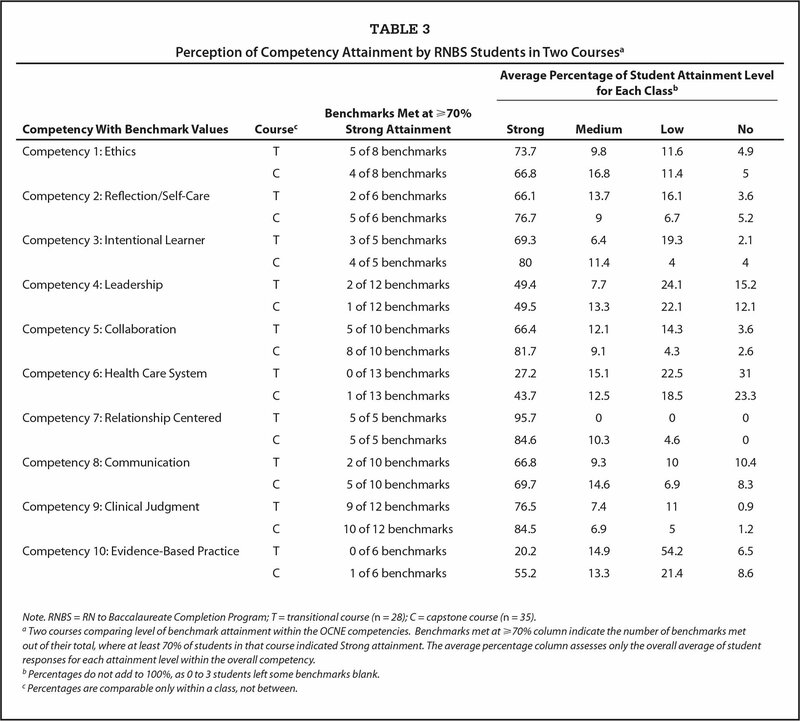 This exploratory study used a mixed-methods approach to assess the written comments from the self-assessment tool identifying student perceptions of proficiency in the 10 competencies and 87 L3 benchmarks. This research builds on pilot study data completed in 2014 (Northrup-Snyder, Menkens, Garner, Marcus, & Clark, 2014) that focused on students' perceived strengths and challenges in meeting OCNE competencies in general, and specifically on Competency 6, Practicing in Broader Health Care Systems. The current study used a retrospective approach to collect data in a snapshot of two concurrent winter 2015 courses with different online student cohorts. This convenience sample removed potential bias about expectations of change found within a longitudinal cohort, providing an opportunity to look only at student language of proficiency in a benchmark self-assessment assignment. Data included demographics, collected during student enrollment, and the required student L3 benchmarks self-assessments. Confidentiality was supported by eliminating any identifying information. Institutional review board approval was obtained. Demographic data and individual answers from the student self-assessment documents were imported into Excel®, formatted, and imported into NVivo 10 software to analyze attributes and themes. Each student self-assessment required a written explanation of how each benchmark was met, providing data that could be thematically analyzed. Missing data for up to three answers within a document was acceptable. A thematic analysis of the documents (Bazeley & Jackson, 2013) first uncovered the meaning and strength of proficiency words within the benchmark statements, which eventually led to a related set of six researcher-defined levels of attainment. An initial list of defined attainment definitions and subthemes was reviewed and refined (Daly et al., 2007). Data coded to each level of attainment could then be quantified using NVIVO and Excel sorting techniques. Researchers conducted independent analyses and meetings were held to explore continuity of coding strategies toward interrater reliability (kappa coefficient of 99%). An audit trail was used to capture unfolding attainment definitions and benchmark coding strategies. A total of 72 students in the transition course (n = 30) and capstone course (n = 42) participated. The sample population was reduced to 28 in the transition and 35 in the capstone courses due to missing assignments. Student self-assessments of each L3 benchmark provide the basis for thematic analysis and were parsed and coded using a two-step process. First, a coding system was created by reviewing student proficiency statements for positive or negative language cues related to how practice, self-confidence, and barriers to proficiency in the benchmarks were described. The student statements were parsed to assess both the individual words or phrases and the context of the full response to the benchmark. The following statement from a student, describing literature search skills, provides an example for discussing each step: “Much better. Not met. I still spend way too much time going down rabbit holes in my research.” In the student example, “Much better” suggests moderate proficiency, “Not met” suggests nonproficiency or nonattainment, and the final sentence suggests awareness of the issue and potential for remedies. This parsing of the student proficiency language provided the foundation for creating six levels of attainment strength with word cue rules, definitions, and sample language for further coding and analysis. The initial six levels were collapsed to strong, medium, low, and not attained to minimize coding errors and improve distinction between levels. Second, student narratives were coded to a level of attainment by considering full responses of proficiency within the context of the corresponding benchmarks. Using the example above, when the full statement is assessed, even with the mixed language, it is clear this student is attaining this benchmark at a moderate level, with awareness of areas for growth. The researchers minimally interpreted students' benchmark proficiency statements toward attainment levels. For example, some students would simply answer with “met” or “not met.” Other student responses included additional details supporting their perception of proficiency to suggest a level of attainment. A final set of definitions for each attainment level was used to support coding. Quantitative values were obtained by transferring NVIVO reports to Excel to explore values of attainment related to each competency and benchmark. Within the transition and capstone courses, benchmark attainment was established if 70% or greater of the students' self-assessment statements reached the strong attainment criteria. Nonattainment of a benchmark occurred when 20% or more of students were coded as not attained. Students in both courses were predominantly White, female, and under the age of 39 years (Table 1). Each group shared a broad range of nursing practice experience in terms of years of experience (0 to 20 years), place of employment, and geographic location. Although experiences with acute or community care varied, most students had acute care experience. In the thematic analysis of the L3 benchmark self-assessment assignment, researchers explored coding strategies and themes. The emerging themes reflected a range of language strength (Table 2). The strength-based language subthemes recognize empowerment through experience or natural talents. Ambivalent language is softer, is less confident, or indicates partial proficiency in the benchmark. The challenge language categories suggest either areas for growth or barriers to benchmark attainment. I am called to examine ethical dilemmas of this sort at times; sometimes a patient isn't necessarily an ideal candidate for detox (they must be in need of medically monitored detox to be a patient), but sometimes, patients need to be safe, or to hide, or to just switch up their patterns for a period of time because they can't do anything without a bit of help. In these cases, I bend the rules a little to get them admitted. I learned some about the power and effectiveness of using the legal system and advocating for new laws to address community risks and hope that further legislation will address issues of gun safety and other major health risks in the community. Hard to see this one in my time in home health and employee health. I need to look for opportunities where I can lead interdisciplinary teams. Working night, it is a little bit difficult. The four coded levels of attainment were sorted in Excel and reviewed under the categories of benchmark, competency, strength of attainment, and course. The analysis of each competency is tied to two sets of results for each course (Table 3). First, the benchmarks were assessed within each of the 10 competencies looking for 70% and higher strong attainment results. Each competency has a variable number of benchmarks; thus, it is difficult to draw strong conclusions for the overall level of attainment. However, within each course, strong attainment was achieved for L3 benchmarks related to intentional learning (competency 3), relationship-centered care (competency 7), and clinical judgment (competency 9). Benchmarks for ethics (competency 1) and communication (competency 8) were achieved moderately in both courses. Ethics and relationship-centered care indicate lower capstone course attainment, which may be an artifact of the different cohorts or an educational effect related to increasing knowledge yields awareness of life-long learning needs. The competencies collaboration with the health care team (competency 5) and reflection on self-care (competency 2) also indicated moderate achievement in the transition course, but achieved strong attainment in the capstone course. Benchmarks under communication suggest low overall attainment within the transition course, but moderate attainment within the capstone course. 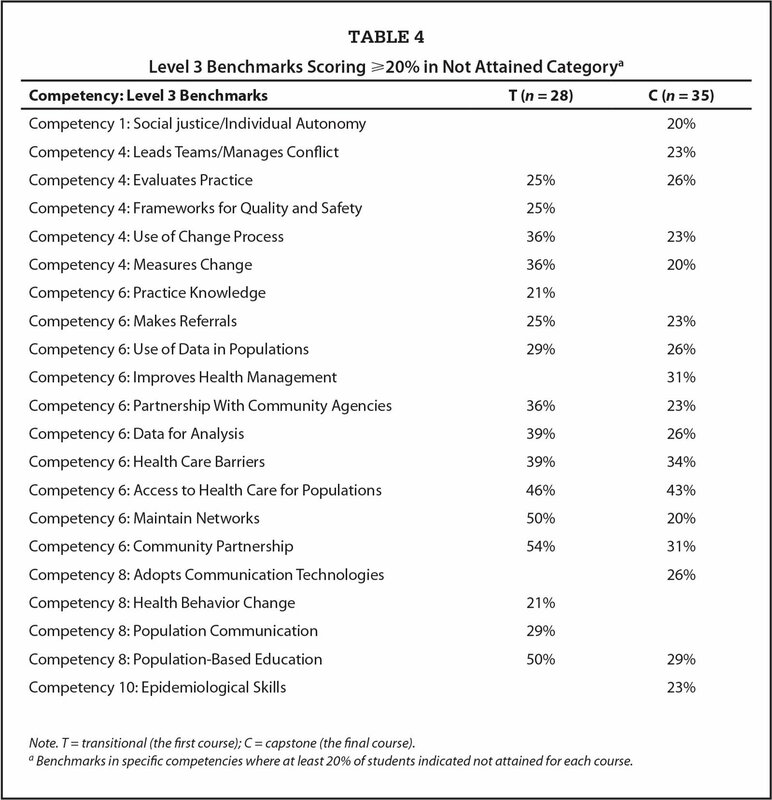 Students in both courses indicated not meeting benchmarks for leadership (competency 4), practicing within the broader health care system (competency 6), and use of best available evidence for practice (competency 10). The second set of results (Table 3) reflect shifts on the attainment scale. Within competency 1, the average percentage of these eight benchmarks is shifted toward strong attainment in both courses. This is also the case for competencies 2, 3, 5, 7, 8, and 9. There is a small shift from a low attainment in the transition course to medium attainment in the capstone course for each of these competencies; however, caution is needed in interpreting these results because these are two different cohorts at a single point in time. Competencies 6 and 10 show a marked shift in attainment in both the number of benchmarks met and the average percentage of attainment in each category. A higher number of evidenced-based practice benchmarks were coded to low attainment in the transition course, with this value shifting to strong attainment in capstone course. This pattern is echoed in the averages for broader health care systems, with the exception of a higher percentage of the transition course scoring as not attained. Within Table 4, broader health care systems accounts for almost half the nonattained benchmarks (>20% in the not attained category) found across the courses. Further, there are several nonattained benchmarks from other competencies reflecting concepts of population health, such as social justice/individual autonomy, health behavior change and population communication, and epidemiological skills. Leadership also features almost half of benchmarks ranking not attained. The RNBS curriculum foundation includes student self-reflection at the L3 benchmark level to advance nurses beyond competence in clinical skills. In the exploration of one RNBS benchmark self-assessment activity, students indicated recognition of and reflected their own understanding of benchmark concept application in their nursing role. Student language revealed levels of confidence and reflected awareness of opportunities, self-efficacy, sense of competence, and personal beliefs. Evaluating students' language of strength, challenge, and ambivalence in the benchmarks, researchers noted connections to a scale of perceived attainment. Leveling perceived attainment provided a first look at student confidence in achieving the OCNE competencies. Issues identified in the student language on proficiency relate to (a) student understanding of benchmark connection to nursing practice, where perceived lack of clarity may further undermine self-efficacy; (b) awareness of opportunities for attaining benchmarks within coursework, clinical placements, or nursing practice; (c) awareness of competency language related to population or community nursing; and (d) application of benchmark concepts, such as leadership or use of evidence, in the broader scope of nursing practice. 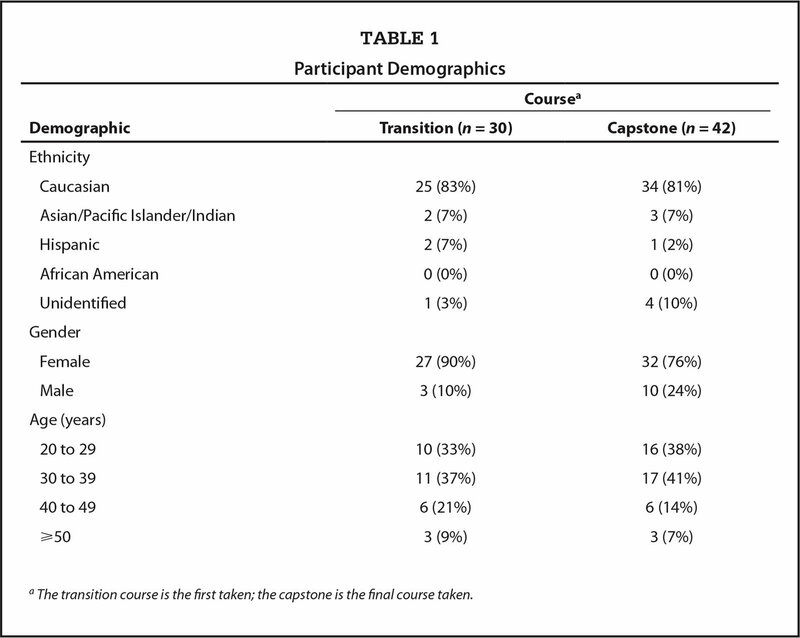 Shifts in students' use of strength language in the capstone course suggest an overall higher level of perceived attainment, compared with the transition course (though not consistently at or above 70%). Yet, use of challenge language revealed some concerning and persistent themes. Students indicated early in their RNBS program and continued to indicate in the final course low perceived proficiency of Leadership, Practicing in the Broader Health Care System, and Evidence-Based Practice. Student language suggests many are experiencing these concepts for the first time, which supports the idea that higher self-assessed competency is correlated with more frequent use and application (Meretoja, Isoaho, & Leino-Kilpi, 2004). Further, tests of new graduate competence reflect comfort in individual care roles and critical thinking (Wangensteen, Johansson, Bjorkstrom, & Nordstrom, 2012). Given the focus within the AD program on individual and family care, coupled with the relative importance placed on clinical practice in acute care settings, this lack of competency attainment in leadership, population health care, and use of evidence may be expected. However, persistence in the lack of or low attainment of these same competencies, even with a high percentage of didactic and clinical work focusing on these competencies through the final year, is concerning. Related assignment grades indicate students understand applications at high levels of proficiency, although direct correlation was not assessed. Implications of this study suggest a need to build stronger connections between each learning activity and the OCNE benchmark within the curriculum to better develop student ownership of proficiency with application. Aligned with this focused action is the broader need to communicate benchmark concepts within and across the curriculum. Students also need guidance to strengthen their self-efficacy, recognize the relevance of, and integrate each benchmark into their nursing practice. In the original OCNE curriculum design, competencies and benchmarks supported teaching across the curriculum. Yet, a lack of intentional connection across courses within the curriculum may reduce students' ability to translate benchmarks across course, clinical, and practice activities. For example, although a leadership course may focus on leadership change management benchmarks, it is necessary to also guide students on applying these skills within the context of population-based health courses to build situational self-efficacy. Bridging the OCNE benchmarks and competencies into practice should also be considered. The function of nursing education, and specifically, the OCNE competencies are to transform the student into a competent nurse. Yet, without workplace support for these competency behaviors, novice nurses will not have the opportunity to build competence (Seright, 2011; Yoder et al., 2014). Benefits to building on the workplace competencies initiated in school include the positive relationship between perceived or actual competence to empowerment, satisfaction and quality of care which also improves retention (Numminem, Leino-Kilpi, Leino-Kilpi, Isoaho, & Meretoja 2015; Ulrich et al., 2010; Walker & Campbell, 2013). Helping students to understand the broad application and use of evidence across population-based and acute care practices is also crucial. For example, the benchmark epidemiological skills within competency 10 can be translated from population concepts into acute care situations to explore numbers of surgical-site infections. Similarly, in leadership, epidemiological skills can be used to explore the relationship of nursing turnover to acuity levels or staffing ratios and implications for patient care outcomes. Encouraging students to take learned concepts and skills into future courses and practice by bridging this information in the curriculum may increase self-perceptions of proficiency. Study limitations include data focused on one time point with two cohorts of RNBS students at different parts of the curriculum. It is difficult to draw conclusions across the two cohorts and compare experiences fully from their prelicensure programs. A longitudinal cohort followed over the course of the RNBS curriculum would provide stronger data to assess student perceptions of proficiency. The benchmark self-assessment assignment occurs early in each course. For the capstone course, this means the benchmark review does not capture the final clinical experiences. Data analysis of a final review at the end of this course might note a shift in self-reflection language or assigned attainment categories in some of the benchmarks. This mixed-methods study to assess student perceptions of competency attainment is the first completed for the OCNE final-year RNBS Completion Program. Other OCNE programs and curricula have not been explored using this method. Examination of students' language of self-perception is a critical component to understanding competency attainment. This initial study of student perceptions of benchmark proficiency supports the use of four attainment categories (strong, medium, low, nonattainment). This scale provides one way to assess student benchmark attainment within the curriculum, providing information to support ongoing curriculum revisions to address areas in which students do not perceive competency. Further integration and translation of the benchmark concepts may increase student self-perception and efficacy. As a result of this study, the RNBS faculty addressed the OCNE benchmarks across the curriculum and continue to explore areas for improvement. Future research to develop a quantitative tool to assess student perception of proficiency would increase the ease of student and faculty assessment of benchmark strengths. Further, such a tool would help identify gaps in attainment, providing evidence to support assessment of curriculum and course learning activity revisions to better emphasize the attainment of benchmarks. The results of these assessments on student perception of competency and benchmark proficiency can guide didactic and clinical options, student professional development, and curricular revisions relevant to the use of the OCNE competency framework across all curriculum levels and programs. What percentage of benchmarks should be met to achieve a baccalaureate degree? If not met within the degree program, at what point in the nursing profession should these benchmarks be met? Is there flexible application of benchmarks for some specialties or work shifts? Should there be equal curricular application of related benchmarks for acute care practice and practice in diverse populations and communities? The vision of OCNE is to bring each competency into any nursing practice. These questions and future exploration will continue to drive the OCNE competencies and benchmarks to reflect current and future practice to meet nursing, employer, and patient needs. Bazeley, P. & Jackson, K. (2013). Qualitative data analysis with NVivo (2nd ed.) Thousand Oaks, CA: Sage. Gubrud, P., Shaver, K., Tanner, C.A., Bennett-Stillmaker, J., Davidson, S.B., Flaherty-Robb, M. & Wheeler, P. (2003). A challenge to meet the future: Nursing education in Oregon, 2010. Journal of Nursing Education, 42, 163–167. Northrup-Snyder, K., Menkens, R., Garner, A., Marcus, A. & Clark, M. (2014, October). Addressing practice competencies across acute and community nursing to reduce healthcare disparities. Podium presentation at American Public Health Association. , New Orleans, LA. .
Numminem, O., Leino-Kilpi, O., Leino-Kilpi, H., Isoaho, H. & Meretoja, R. (2015). Newly graduated nurses' competence and individual and organizational factors: A multivariate analysis. Journal of Nursing Scholarship, 47, 446–457. Seright, T.J. (2011). Clinical decision making of rural novice nurses. Rural & Remote Health, 11(3), 1–12. Sherwood, G. & Zomorodi, M. (2014). A new mindset for quality and safety: The QSEN competencies redefine nurses; roles in practice. Nephrology Nursing Journal, 41(1), 15–22. Ulrich, B., Krozek, C., Early, S., Ashlock, C.H., Africa, L.M. & Carman, M.L. (2010). Improving retention, confidence and competence of new graduate nurses: Results from a 10-year longitudinal database. Nursing Economic$, 28, 363–375. Utley-Smith, Q. (2004). 5 competencies needed by new baccalaureate graduates. Nursing Education Perspectives, 25, 166–170. Consciousness Awareness Practice philosophy or attitudes echo L3 benchmark concept. Learned or Learning Reports life experience or purposeful learning in nursing practice. My Strength Identifies the skill or behavior as a personal strength. Natural Describes skill or behavior as natural to his or her personality. Active Practice Practice examples use active verbs, such as incorporate or evaluate. Behaviors such as delegation, collaboration, or design are included as a subset of the action verbs. Confidence Statements of confidence within practice. Mastered Use of the terms expert or mastered when describing a skill or behavior. I Need to Identifies learning or actions needed to be taken to increase ability with phrases “I could” or “I should”—included with the qualifier “but” to explain why the benchmark was not yet applied. Somewhat or Sometimes Suggests the benchmark is partially applied, but with little routine to form a new habit. Moderate Confidence Softer than the confidence theme in Strength Language with rationale for limited use of the benchmark. Partial Completion of L3 Benchmark Reports proficiency in only one of multiple objectives within a single benchmark. Learning to Apply Describes active awareness toward learning new concepts with peers or in course work. More Experience Necessary Softer than the Mastery theme in Strength Language—by noting the need for more experience before mastery of the benchmark. Too Busy Reports difficulties due to time constraints in personal life, nursing role duties, or patient acuity levels. Night Shift Identifies lack of patient wakefulness or access to resources on the night shift. May identify ways to mitigate barriers. Growth Potential Expresses interest in applying the concept in practice, but cannot identify options or describes a lack of previous opportunities. Dr. Northrup-Snyder and Ms. Menkens are Clinical Assistant Professors, School of Nursing, Oregon Health & Science University, and Ms. Dean is Staff Nurse and Graduate Student, Doernbecher Children's Hospital, Portland, Oregon. The authors thank Dr. Casey Shillam for her thoughtful reviews and suggestions toward development of the Figure. Address correspondence to Kathlynn Northrup-Snyder, PhD, RN, CNS, 1243 SE Jefferson St., Dallas, OR 98338; e-mail: northrup@ohsu.edu.